Preserving character in an old home sweet home! There is something so special about old and original features to a home. That’s why when renovating an older place, it’s important to try to bring it back to its former glory! Because it takes you back to a simpler time when natural woods and unique touches throughout made the place home. Don’t get me wrong, builder grade homes often get a bad rep for using cheap materials and creating streets of identical homes, but the efficiency and (in most price ranges) the quality truly is there. Newer materials and updated appliances in today’s world is a must. However, taking the bones of a classic Tudor and refurbishing items throughout to make it ‘like new’ can still hold onto the charm because that’s there from the get-go. 4442 Longfellow Avenue in Minneapolis is my most recent renovation project. 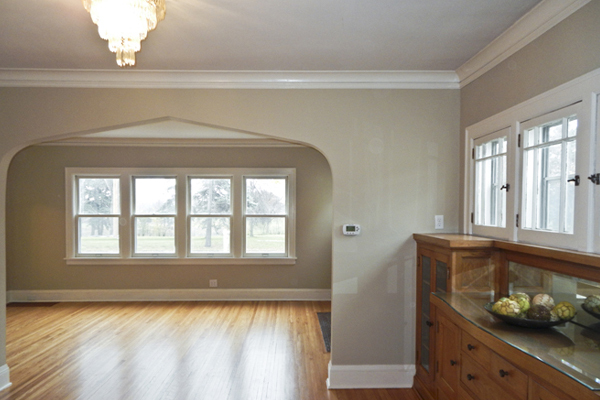 Built in 1926, this home had all the structural style and flare I was looking for. It just needed a little loving and some updates so a family in this century would be able to (and truly want to) live in it. As you drive down Longfellow Avenue, just off Cedar (an easily recognizable street name for any city-goer, and so giving directions to your place is a breeze! ), you’ll drive past years of history. Most of the homes along this street were built around the same time as 4442 and therefore give your neighborhood that classic neighborly feel! On the other side of the street – Hiawatha Golf Course! Lined with trees and glimpses of greens, your front yard view will always be in good shape! When 4442 was built, this view was still just a new park around Lake Hiawatha. Just a couple years before, the park board established a skating rink on the lake and a few years after 4442 was built, construction of the golf course began. The material from dredging the lake was used to build the rolling hills of the course making it more interesting and “sporty.” When it was complete, the charge to play nine holes was $0.35! Could you imagine?! Today, Hiawatha is a great city course where the holes are difficult but not too challenging. It is a Par 73, 18-hole course with a lot of practice space and ideal scenery. The whole area actually has a lot to offer in addition to the golf course. Parks and trails everywhere and local businesses down Cedar are always nice to see. Of course there’s a Caribou down the way and a Super America. But there is also a Supervalu Foods, the Cedar Quick Stop, Carbone’s Pizzeria, Ice cream place down the street, and Tom’s Popcorn Shop… a landscaping company, photography, and repair shops. And all of this along bus lines. Also, a huge feature for this area – the walking paths around Lake Nokomis! Getting out and exploring your area is great to do early on. Picture yourself living here and the things you’d go out to see and the places you’d return to. Pull up to 4442 and the red door greets you. Additional landscaping and a fresh coat of paint make all the difference in the curb appeal. You can definitely tell this is an older home, but one that has been taken care of in its 90+ years. It gives you a reason to move in and a connection to the past that already makes you feel like this is home, not just a house to live in for the time being. Original but refinished oak hardwood floors spread throughout the main level but what I love most is the thick baseboard and unique crown molding. I chose a neutral color for the walls to bring out the white woodwork and gleaming floors. You’ll notice the classic vents in the baseboard and actual grates in the floor. Unique windows, a wood burning fireplace, and built-ins are typical in older homes. But with a fresh coat of paint, good cleaning and a little elbow grease, they don’t look old. They look classic. In the kitchen, your storage space seems endless. I kept the original floor-to-ceiling pine cabinets and just refinished them to shine. All the different nooks and crannies that were common in kitchens in the “olden days” are still there and the pull out cutting board as well. I did give the kitchen a face life by bringing in new stainless steel appliances and granite countertops because having items that work well in today’s fast pace world is just as important as maintaining the character. The kitchen is a perfect example of mixing old with the new. Additional updates throughout the rest of the house were also done with functionality in mind. Adding a wool runner to the staircase kept the old-time feel but also make them cozy and comfortable to walk up and down. When you’re sneaking down to the kitchen for a glass of water in the middle of the night, you won’t miss a step. The upper level master suite is modern and looks fresh. So to bring some of the old up to the “attic,” I used some doors from the main level. The original doors now add the desired feel to the master suite and removing them from downstairs opened up the space to make maneuvering through the hallways more manageable. In the olden days, they liked to close off the hallways to the bedrooms to keep those rooms cold for sleeping and the entertaining spaces like the dining and living rooms nice and warm. Today, lets face it, we like heat throughout the house and most homeowners prefer an “open concept layout” vs closing things off. Although the basement is unfinished, it’s not a ‘creepy unfinished basement’ and definitely has that open concept layout so the potential for an additional family room is right there for you! Your back yard is modest but when you live in this kind of neighborhood, houses are fairly close to each other and you wouldn’t expect much for a yard. It is however, the perfect size for late summer barbeques and small get-togethers with the neighbors. So… Who’s ready to move-in!? If this sounds like home sweet home, or if you would just like more information on this or other properties, contact me. I’d be happy to take you out on a showing!